The Class of 1968, left to right: Kathy (Benson) VanDyck, Jean (Wahlstrom) Salley, Dr. Marian Frerichs, Carol (Machalinski) Revzan, Nancy (Jacobs) Jacobsen, Linda (Anderson) Cassata, Linda Olson, Joann (Willis) English. 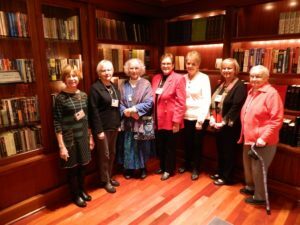 Several graduates of the NIU School of Nursing Class of 1968 gathered for their 50th class reunion recently. Favorite faculty member Marian Frerichs also made a guest appearance. Derryl Block, Dean of the College of Health and Human Sciences, welcomed them and expressed the pride that the school, college and university have in their accomplishments over the years. While the alumni updated the group about their lives and careers, one theme emerged: they felt thrust into leadership positions early in their career because they had a bachelor’s degree, which was rather rare at the time for nurses. Some of the graduates went on to receive doctorates and held senior academic positions in nursing. The class had a chance to interact with some current nursing students and some things, such as demanding academics and clinical rotations, have not changed much in 50 years. Next Post:Nutrition In yoU: What’s the deal with dairy?